Topic: Market Outlook after Election - What stocks to see? The result of US presidential election surprised markets as Republican candidate Donald Trump was elected. Major Asia Pacific markets broadly fell with Nikkei 225 Stock Average tumbling 5.4%. Hong Kong stocks followed to decline 2.2%. Straits Time Index, after opening higher 17pts, once plunged 60 pts to bottom at 2760. Market however dramatically recovered to close at 30pts or 1.1% to end at 2789 after Trump Victory speech reassures investors on rebuilding the nation and promise to do a great Job. Just a week ago, Andy mentioned that investors should cash out of GOLD and move back to buy STOCKS. Indeed Gold price was under pressure and crash to 1220 following Trump's election. Andy thinks that with the uncertainty in the market, US Federal reserve might delay the Rate hike in December. If that is the case, Andy advises that REITS could be a good sector to invest for now. He is looking at Keppel DC reit, Capitacom Reit, Mapletree Com Reits. Apart from Reits, there are also many other Singapore Stocks that Andy is looking at now! Do come and learn to find out what are the Singapore Stocks you can look at now! ✔ What are the Strong Stocks to watch in Singapore? ✔ How do you sell a stock at the highest point? ✔ How do you use the BIG Players Barometer to gauge whether there are Big Players now? ✔ What is the SAFEST WAY to buy into a stock that is on an uptrend? ✔ What is the Best Performing Sector and Worst Performing Sector of the month? from its high reached in 2013.
in the property market for those who are ready to go into properties!! property experts to share with our Options trading network to add value to us. trend and the various strategies to buy properties with little money. did it in business too! 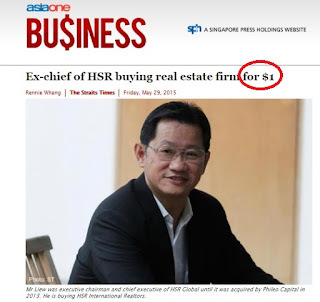 listed company with $1 only! Bill Clinton (Former US president) etc. from this property investment expert together in a 3 hour Property Mastery Class! Register here for your free seat. What you will learn in the Property Mastery Class? 3） Which Areas of Singapore should you focus on to Buy Property Now? 7） The 7 wealth-creation questions you MUST ask before buying any property. These questions are based on Patrick's 20+ YEARS of real estate experience!